Making time this morning to dig deeper into design thinking. The IDEAS blog shared on “The Learner’s Way” site (http://thelearnersway.net/) shares the story of one of the pioneers of design thinking … Stanford University’s dschool. Stanford University has been a pioneer of ‘Design Thinking’ since founding its dSchool in 2005. Founder David Kelley explains that ‘the central tenet of Design Thinking, isn’t one of aesthetic or utility, but of empathy and human observation’. It is a process for finding new ways of solving problems and for identifying problems worth solving. It is much more than a process of design and it provides a structure in which critical thinking, reflection and evaluation is the key. Seen in this way it is what 21st century teaching and learning is all about. The methodology of ‘Design Thinking’ is the key to its value. It provides a structure and language for collaborative problem solving that allows teams to be more powerful than they would without it. Ewen McIntosh of ‘NoTosh‘ describes it as the box that gives you a place to work within. 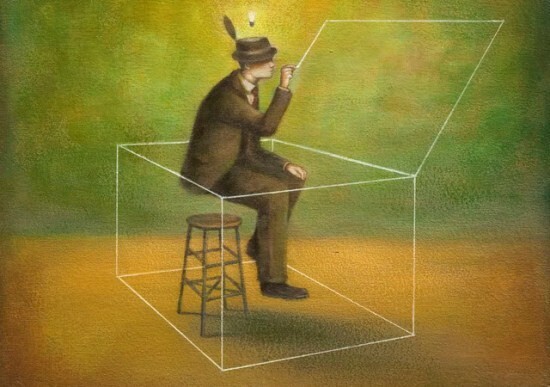 ‘You want to think creatively, you NEED the box to think inside of. You need a common process to go into new places.’ Rather than throwing out the box, ‘Design Thinking’ turns the box into a worthwhile process that facilitates problem solving and ideation. In this model the box is not a constraint but a structure that enhances creativity. ‘Design Thinking’ engages learners in a highly iterative process grounded in evaluation and critical reflection, both highly valued processes. Research by Looijenga, Klapwijk and de Vries titled ‘The effect of iteration on the design performance of primary school children’ explored the benefits of a highly iterative design process for young students. They found that ‘Effective knowledge expansion comes by thinking about already acquired knowledge and also by searching for definitions and explanations of not yet understood knowledge. Both activities are practiced during design activities.’ This study used simple design tasks with young learners, not the more involved and student driven tasks typical of a ‘Design Thinking’ process and yet the results showed that the iterative process of design tasks required high order thinking skills that could be transferred to other learning contexts. ‘Design concepts emerge and become complete through iteration of analysis, synthesis and evaluation’. For schools using Bloom’s taxonomy the evidence here is clear that ‘Design Thinking’ will not only target the high level thinking skills which are so desirable but will require them to be used over and over again by the students as they evolve their ideas. Observe a group of students engaged in ‘Design Thinking’ and you will see similarities to the way students play. Unsurprisingly Looijenga et al. noted this in their study. ‘Playing includes experimenting with the same thing, with small variations, over and over again. Every repetition of the experiment gives improvement in performance.’ This sort of constructive play according to John Dewey, amongst other skills and dispositions encourages students to take responsibility for their own learning. What you are also likely to see is learners engaging in a process of self-explaining in which they describe their thinking to themselves or share their ideas with collaborator or teacher. ‘Eliciting self-explanations clearly enhances learning and understanding’ states Chi, De Leeuw, Chiu and LaVancher in their study on the effect of self-explaining. Chi et al. found that self-explaining is a constructive activity and it occurs frequently within the ‘Design Thinking’ process. Further they found it encourages integration of new learning with old and as it is a continuous process where partial explanations are evaluated and added to ‘self-explaining’ can manage conflicts and misunderstandings between new and old knowledge. ‘Design Thinking’ encourages this sort of iterative self-explaining and constructive play.